I'm sorry, you were saying something about a break-up?" After his critically ballyhooed turn in the 2007 dramatic thriller The Lookout, it seemed as if stardom was right around the corner for Joseph Gordon-Levitt, previously best known as a regular on TV’s Third Rock from the Sun. Unfortunately, aside from his lead in the criminally unheralded (500) Days of Summer, his most exciting performance since was an acrobatic song-and-dance rendition of “Make ‘Em Laugh” while hosting Saturday Night Live two years ago. 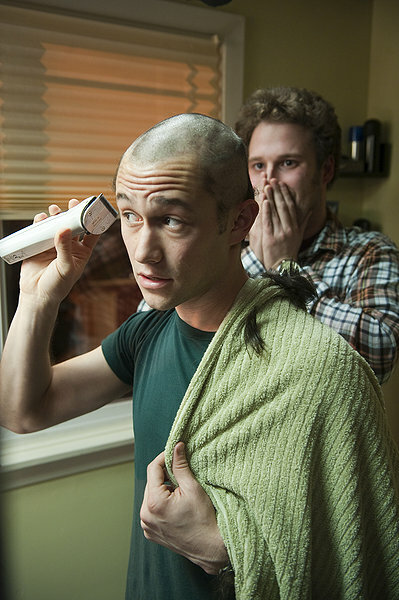 Gordon-Levitt’s greatest strength as an actor is also his largest impediment to celebrity. He prefers to inhabit a role rather than inflate it, plying an acting style that is unpretentious and nuanced. These attributes serve him well in 50/50, a dramatic-comedy about a 27-year-old’s grueling struggle with cancer. The film’s title holds dual meaning. It represents the odds a cold, impersonal oncologist gives Adam Lerner (Gordon-Levitt), a Seattle NPR staffer and aspiring documentary filmmaker, to survive the malignant tumors found along his spine. Moreover, it’s the approximate division between drama and bawdy humor employed by screenwriter Will Reiser’s semiautobiographical script. In the hands of less capable filmmakers and cast, this balancing act between somber sentimentality and Apatow-esque comedy could nosedive into something ill-advised and even offensive. The greatest testament to 50/50 is that director Jonathan Levine (The Wackness) integrates its two halves in a way that elevates the whole. The film is as much about the way Adam’s intimates react to his illness as the impact it has on him. The key players are Kyle (Seth Rogan, ably playing Seth Rogan), Adam’s oafish, heart-of-gold best friend; Rachael (Bryce Dallas Howard), Adam’s live-in girlfriend and as aspiring artist; Diane (Anjelica Huston), his overbearing mother; and Katherine (the equally undervalued Anna Kendrick), Adam’s perky, inexperienced therapist who eventually takes a shine to her new patient. Reiser treads familiar territory, like the physical ravages of chemotherapy. But, he also shares stories only a survivor could tell, such as the complex dynamics of a support group of fellow suffers, new friends who might pass on as quickly as you get to know them. The most glaring misdiagnosis 50/50 makes is its treatment of the women in Adam’s life. Most notable is Rachael, whose indefensible response to the sudden pressure of coping and caring for a terminally sick boyfriend is nevertheless grounded in genuine and complex emotions worth exploring in an intelligent fashion. Instead, she gets called the c-word and ridiculed as a personal and professional failure. Diane’s histrionics barely subside long enough for a late, fleeting expression of motherly concern. And Reiser seems oblivious that Katherine, the story’s ostensible heroine, oversteps the ethnical line separating doctor and patient. The tonal duality of 50/50 is more than a mere gimmick. It’s the language of ironic distance spoken by Gen-Y moviegoers who largely have not faced their mortality. When Adam, on the eve of a make-or-break surgical procedure, locks himself in Kyle’s car and finally unleashes some pent-up primal therapy, all the cackles that precede it – along with Gordon-Levitt’s talent – make the moment feel all the more real.